Eighteen years after I wrote my first orchestral work Horse Tooth White Rock (last performed at the BBC Proms in 2005), Tibetan Buddhism is once again a source of inspiration. Cave of Luminous Mind is my third orchestral work, inspired by the meditational journey towards Enlightenment, of the Tibetan saint Milarepa (c.1052 – c.1135 CE). The meditation technique of following the in-breath and the out-breath with mindfulness has generated within me a musical response in the form of a highly sculpted work whose motion and energy propel forward non-narratively. Radiant textures are embedded within shimmering harmonic fields of varying density that generate surprising climaxes against slow moving rhythmic pulses. Jetsun Milarepa spent years in meditation, practicing the techniques of Vajrayana discipline (the Diamond Path) as he learnt it from his teacher Marpa. Over the years Milarepa moved from cave to cave in the mountain ranges of Tibet, seeking shelter as he single-mindedly pursued the path to Enlightenment. He gave many of these caves beautiful names. One such was the ‘Cave of Luminous Awareness’, which directly inspired the title of my work. Luminosity was naturally very much at the forefront of my mind as a core consideration underlying the vibrancy and the changing colours of the musical fabric. My composition is dedicated to the late composer Jonathan Harvey whose life and musical expression embodied qualities of luminosity in such an astonishing proliferation of works, and whose thought processes similarly took refuge in the wisdom of Tibetan Buddhist practice. Nineteen years after I wrote my first orchestral work Horse Tooth White Rock (performed at the BBC Proms in 2005), Tibetan Buddhism is once again a source of inspiration. Cave of Luminous Mind is my third orchestral work, inspired by the meditational journey towards enlightenment of the Tibetan sage Milarepa (c1052–c1135). The meditation technique of following the in-breath and the out-breath with mindfulness generated within me a musical response in the form of a highly sculpted work whose motion and energy are propelled forwards non-narratively. Radiant textures are embedded within shimmering harmonic fields of varying density that generate surprising climaxes against slow background rhythmic pulsation. he single-mindedly pursued his quest for enlightenment. He gave many of these caves beautiful names. One such was the ‘Cave of Luminous Awareness’, which directly inspired the title of my work. Qualities of light were naturally very much on my mind as I developed this composition and the changing colours of its musical fabric. The two movements of the work are contrasted in character and pacing. The first, slow movement is fashioned from modal scales and harmonic fields that emphasise semitones and clusters. A gently unfolding string glissando appears many times, creating a soft halo for the melodies that unfold, even as it points to the transient nature of all phenomena. The following faster movement serves as a metaphor for Tibetan meditational transformation. It is akin to a musical thunderbolt, a vibrant energy that underlies the extraordinary stillness one sees in Buddhist icons. Colour and luminosity are achieved by deflecting swiftly changing timbral fragments against symmetrical harmonic fields that stabilise and unify the fast-paced texture. My work is a tribute to Tibet’s rich spiritual tradition that has kept alive the unparalleled tenets of Buddhist teaching, most especially the meditational disciplines that lead to peace and enlightenment, despite Tibet herself suffering most cruelly at the hands of an alien, occupying power since the 20th century. Cave of Luminous Mind is dedicated to the late Jonathan Harvey, whose music embodied qualities of light in an astonishing proliferation of pieces, and whose creative vision brought forth so many works fired by the wisdom of Buddhism. My encounter with Jonathan’s music and my subsequent study with him were a source of great enrichment to my life. The opening of the second movement "Vibrant". Sakari Oramo’s second Prom as Chief Conductor of the BBC Symphony Orchestra proved a substantial affair, opening as it did with a new work by Param Vir. Best known for his stage-works, Delhi-born Vir has long evinced a complete mastery of the orchestra and the 22-minute Cave of Luminous Mind (2013) confirmed this in no small measure. Subtitled ‘The Transcendent Journey of Milarepa’, it takes its inspiration from the quest of the Medieval Tibetan sage – here portrayed over two complementary movements. The first, ‘Still’, unfolds gradually though never hesitantly – the caressing modal harmonies underpinned by subtly variegated string glissandos; whereas the second, ‘Vibrant’, is richer in incidental detail yet altogether more demonstrative in its rhythmic energy which generates a considerable expressive frisson towards the close. Dedicated to the memory of Jonathan Harvey, this is an impressive addition to Param Vir’s catalogue and received a performance from the BBCSO both scrupulously prepared and vividly projected. Meanwhile Prom 52 brought a newly-commissioned work which had an inspired assurance from first note to last. Param Vir has spoken of ‘sculpting’ his textures in Cave of Luminous Mind, and that was exactly how it felt: using endlessly-rising pianissimo string glissandi, he created the impression of a vast bowl of hazy sound out of which instrumental solos eloquently surged. Under Sakari Oramo’s direction, the BBC Symphony Orchestra gave the work a radiant luminosity: we’ve had a lot of new pieces parading their Buddhist credentials recently, but this one really did justify its claim to reflect the experience of meditation. In a season in which new works at the Proms have been distinctly under-par, Param Vir’s commission, Cave of Luminous Mind, inspired by the path to enlightenment of the Tibetan Buddhist Milarepa, was at least full of beautifully imagined sounds and finely chiselled detail. Although the way in which each gorgeous moment connected with the next, and why the 25-minute, two-movement work was proportioned the way it was weren’t always obvious, the confidence with which Vir handles the sheer scale and the forces involved was hugely impressive. Last Wednesday’s world première of Param Vir‘s new Proms commission, Cave of Luminous Mind, gave particular pause for thought in light of its position in the season. Twice recently we have been presented by works from composers of Indian descent…, works seeking at least in part to acknowledge the disjunct traditions of east & west, yet both composers seemed compelled not to seek a deep synthesis, but to contrive a weak symbiosis by diluting their respective sources of inspiration & tribute. Aside from these works, just once has the (holy) ghost of religion raised its head in this year’s new music (from Sofia Gubaidulina), & then in violently apocalyptic fashion. Which brings us to Cave of Luminous Mind, another of Param Vir’s works in which “Tibetan Buddhism is once again a source of inspiration […] inspired by the meditational journey towards enlightenment of the Tibetan saint Milarepa”, & which is dedicated to contemporary music’s most radical of spiritual seekers, Jonathan Harvey. On its own terms as well as in light of these preceding works, Cave of Luminous Mind was already thought-provoking even before the BBC Symphony Orchestra, under Sakari Oramo, had played a single note. But it’s even more thought-provoking afterwards, an extremely fascinating work that feels very much larger & longer than its relatively concise 20-minute span. It is, in fact, like a kind of mini-symphony, two wildly contrasting movements that propel us into environments that are both very strange, but for very different reasons. The first is, on the face of it, the more accessible of the movements. It emphasises space & clarity of utterance, unification & solidarity in its material & orchestration. Woodwinds tend to chatter, an assortment of duets emerge, the harp concerns itself with captivating flourishes & cadenza-like episodes, percussion—& this makes it sound as though the music is less gentle than it is—opts for hard-edged xylophone rattling & heavily accented metallic thumps. & through, above, under & around them all, unifying everything, is a seemingly endless fabric fashioned from upward-sliding strings, a mystical surface of Shepard tones that establishes the context for everything else to play out. Despite often not featuring in the foreground, the strings are by far the most pervasive timbral force in this movement, occasionally afforded the opportunity for a solo melody, or combining to form a kind of lustrous veil, as well as giving the music one or two unsettling shoves into more ominous territory. Its counterpart confounds on more than one level: why break the potent mood established by the first movement? why shift so completely from its engrossing material & style of delivery? & besides, what the hell is going on in this movement? All reasonable questions when confronted by the unexpected ferocity of Cave of Luminous Mind‘s second movement, which continues the instrumentational affinities already established, but now at breakneck speed, regularly breaking out in barely-controlled hammer blows. These are all Param Vir offers by way of obvious clarity, choosing instead to dive, full throttle, into a maelstrom of hectic tuttis, slithering textures of echoing, overlapping lines, massive crescendo blasts & almost ludicrously intricate polyphony. The music is practically snapping at its own heels, as though (to switch metaphors) it’s trying to break beyond its confines, smashing against invisible walls. Is Vir’s cave proving too restrictive a habitat for the mind? or, more likely, is it not confined at all—are we hearing a hint of the vast expanses of possibility & liberation that can come from humble points of limitation? Either way, this second movement, for all its boundless energy, is, in hindsight, a great deal more comprehensible & immediate than its predecessor, & as Cave of Luminous Mind fades from buzzing ears, one’s left grappling anew with that first movement, which now seems even more mysterious & unknowable, despite appearances to the contrary. Mysterious & unknowable—concepts that preoccupied Jonathan Harvey throughout his life, epithets that so often characterised his music, as they do Cave of Luminous Mind, making it in every sense a worthy & very powerful homage to its dedicatee. East & west seem entirely & simultaneously omnipresent in the piece, as does the very essence of humanity’s latent spirituality, not in mere contrivances of style or narrative, but in a less immediate & tangible (but more telling) engagement with notions of reflection & meditation, ambiguity & allusion. Perhaps only this way can one truly aspire to the infinite. On 22 August the focus was turned upon the modest but distinguished output of Param Vir, and it was a particular pleasure to be granted another opportunity to hear the scintillating Constellations, written for the Birmingham Contemporary Music Group in 2010. Setting a welcome precedent in this series, the programme also included the world premiere of a new work especially written for the event: commissioned by the Royal Academy of Music for the young pianist Zubin Kanga and dedicated to the composer Bernard Hughes, Intimations of Luminous Clarity takes as its starting point the piano part of Vir’s new Proms commission for the BBC Symphony Orchestra, Cave of Luminous Mind. Having finished the orchestral work, the composer realised that the piano line contained its own integrity and form, and was ripe for further elaboration. The resulting three-minute piece is an intricate miniature written in one single span made up of brief, contrasting episodes, several of them involving hand-stopped notes. The overall effect was of an unbroken dialogue between bold, public statements and more introverted, internal ideas, subtly interrelated. Zubin Kanga’s committed reading kept the score’s overall line firmly in mind so that, despite a variegated, multi-sectional form, it never sounded episodic or disjointed. Vir described Intimations of Luminous Clarity as a ‘curtain raiser’ to his new BBC commission, and it certainly whetted the appetite for his large-scale contribution to the 2013 Proms. 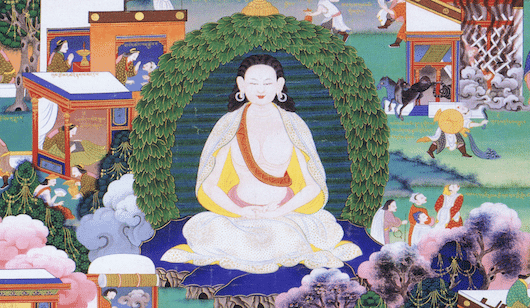 Cave of Luminous Mind is among several of his works inspired by Tibetan Buddhism, in this case the meditational journey of the Tibetan saint Milarepa towards enlightenment. Dedicated to Jonathan Harvey, who was one of Vir’s teachers, it consists of two substantial and contrasting movements, the first predominantly slow and introspective, the second bursting with energy, sometimes held in check but often given free rein in extended tuttis of tremendous sweep and power. Vir’s inventive use of glissandi in the strings throughout the piece was especially striking and his restrained but highly effective deployment of no fewerthan five percussionists was the result of an experienced ear for unusual and magical orchestral sonorities. In his second Prom as Chief Conductor of the BBC Symphony Orchestra, Sakari Oramo proved an ideal interpreter of Vir’s music, and his firm grasp of the score’s trajectory contributed to the performance’s lively and instinctive character. The players responded readily: delicate dialogues between clarinet and horns and, later, cor anglais and solo violin, which created rich thematic material in the opening movement, were beautifully shaped; and the key idea given to the cellos just before the end of the second movement was also sensitively realised, whilst the extensive sections for full orchestra were richly detailed.